How Do I Update Course Curriculum? How Do I Add Skills And Units To My Curriculum? Updating your course curriculum by selecting the course from the Curriculum Directory. If you have not added a course, just click "Add Course" in the appropriate subject (to learn how to create courses, click here!). From the curriculum directory, click the drop down arrow on your desired subject to access a course. Then click the course you wish to update. A - Click "Add Unit" to add a new unit to the course. 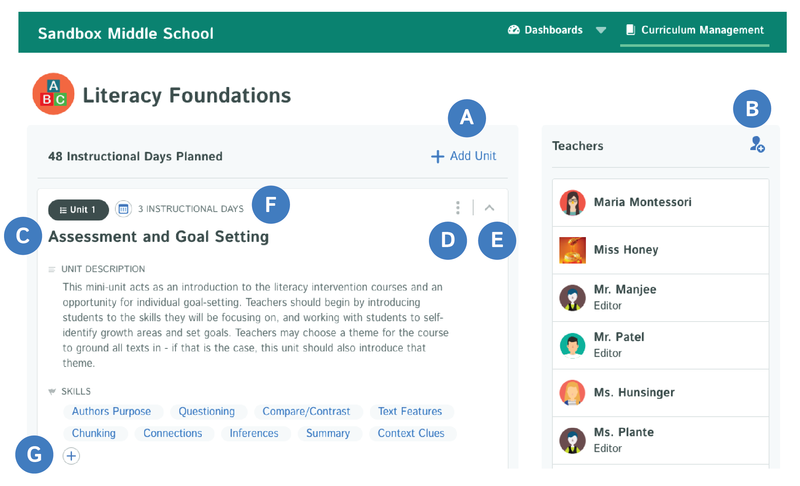 You can add a unit description, skills and instructional days. If you feel the need to reorder your units, you can do that. See letter "D"
B - Add which teachers have access to this course. You may give them view-only permission or permission to edit the course. After they have been added, click the teacher's name to go right into their classroom. C - The title of your unit. You can edit this any time by simply backspacing/deleting the title and adding new text. D - Click the three little buttons to adjust the order in which the units appear. E - Click the arrow to collapse the unit. This gives you more room to work on other units. F - Set the number of instructional days a unit would require. This updates the total number of instructional days at the top of the course. G - Add skills associated with your unit here. You have the ability to choose from state, national, and other uploaded standards or create your own. To learn more about Kiddom Academy, book a demo with us by clicking here!